The written word has robbed us of chunks of history. As long as history was an aural construct, anyone could record anything and it survived as long as it was repeated by subsequent generations. Historians always claim that only written history is legitimate and accurate, even though there is much evidence to the contrary. A written history requires literate people to record it and they are part of the privileged of their age. That privilege implied patronage and patrons always want to be well-remembered. That inevitably means that history is mostly about the famous, the rich, the powerful, the venial, the political, and the arrogant. The author has produced a very novel alternative history. It is a powerful and serious subject but it includes humour and irreverence. An engaging book that rewards the reader. DESCRIPTION: The written word has robbed us of chunks of history. As long as history was an aural construct, anyone could record anything and it survived as long as it was repeated by subsequent generations. Historians always claim that only written history is legitimate and accurate, even though there is much evidence to the contrary. A written history requires literate people to record it and they are part of the privileged of their age. That privilege implied patronage and patrons always want to be well-remembered. That inevitably means that history is mostly about the famous, the rich, the powerful, the venial, the political, and the arrogant. The author has produced a very novel alternative history. It is a powerful and serious subject but it includes humour and irreverence. An engaging book that rewards the reader. The author has taken a time line slice of 1,000 years, the period when England rose from a minor state on the edge of Europe to the first Global Empire, a story of rags to riches in what for history is the blink of an eye. History presents this rapid rise to global power from the view point of the Establishment with a growing edge of patriotism. We know much about the Lords and Ladies, the Kings, the Traitors, the great warriors and even the merchants who brought the great wealth. 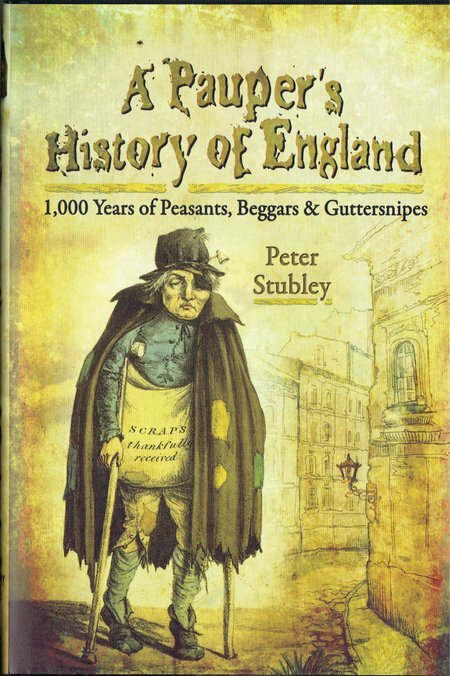 What we know remarkably little about is the great army of the poor who laboured hard in poverty, essential labour that powered the growing Empire. In theory, under the Feudal System, there were no poor. In theory, everyone was gainfully employed as a peasant, a freeman, and craftsman, a scholar, a priest, a man at arms, a knight, a noble, or a king. That almost suggests equality and freedom from want. The reality was very different and, from a bad start, it went down hill to the end of the Victorian period. A fall from grace was a feared risk for every class in the Feudal Society. Those at the very bottom of the heap were outlaws, living a precarious life of hardship and constant danger, brutal execution an ever present threat. Bleak though that life was, it was little better for most of the population. Most classes faced starvation and war, but all of the population faced the risk of plague. The priests made one of their most comfortable livings by trying to persuade everyone else that life was rehearsal and a set of trials for the afterlife. The author has logically followed the events and facets of this thousand year history, taking the perspective of the poor. Doomsday England provides a canvas for the starting point and the Franciscan vow of Poverty provides insight into the priesthood. From that base, the author has built a series of views for each of the ages within that millennium. He has shown how things got worse as time passed, in contrast to the growing wealth of the most fortunate minority. There is a modest photo plate section, but the real illustration is in the words, as the author paints a vivid picture of the section of society that has always been swept to the margins of history.